Start a discussion on the actual topology of the data we're working with and learn about handling incoming data. Here is the simplest topology that we can build using this approach. 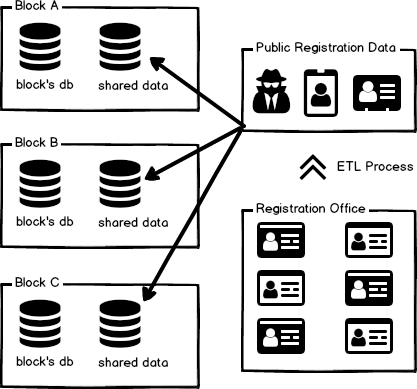 The Registration Office has an ETL process that outputs the data that it wants to share with a dedicated database, especially for this purpose. From this public database, we set up replication to dedicated database instances on each of the blocks. In other words, when the application inside the block wants to access some shared data, it isn’t going to reach over the network and hit the public registration database but instead use a local instance that the public registration database is replicating to. Why do we have this behavior? Because we don’t trust the network and must always rely on our own local resources. When the network is available, we’ll get continuous updates via replication, and when it isn’t available, we’ll have the latest information that we possibly could and can still act on (I’ll have a separate post talking about workflow processes that mitigate eventual consistency and concurrency handling in such a system). This means that the application can always continue running, regardless of the state of the outside world. In this case, each party’s setup includes both the internal data that is required to running the block/office/department in question and a shared database that is used to hold all the data that is shared by all the parties in the prison. Note that the topology of the shared data is a full mesh. In other words, data that is sent to the shared database from the Registration Office using RavenDB ETL will be sent to all the other parties. This is the same as we had before. However, because we now have a shared database, if the Registration Office cannot talk to Block B, that block will still get all the updates from Block A, including the updates that originated from the Registration Office. This is because RavenDB replication uses the gossip model and can bridge such gaps in network without issue. This might be a simpler model because the process of each party publishing information for the consumption of the rest of the prison is simplified. 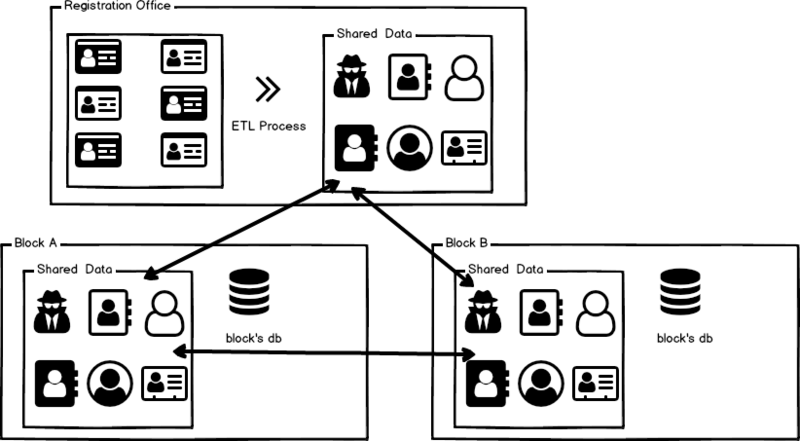 We simply define an ETL process to the shared database and the data will be distributed far and wide, made available to anyone that wants it. This has the advantage that most of the details of managing services can be deferred to RavenDB. You need to make sure that your ETL processes are contractual; that is, they don’t change the shape or meaning of the data, and that is about it. All data access from the application is made to the local database and there is little need to worry about integration between the various parties, error handling of remote calls, etc.